The new semester has started, and things seem to be happening at a furious pace. 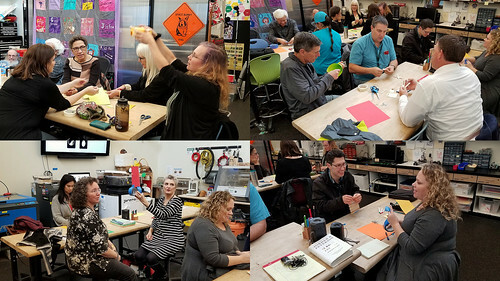 As part of professional development days preceding the semester, we invited faculty and staff for a makerspace update, and facilitated a prototyping workshop, solving problems having to do with babies and robots. Our staff did some outreach to invite students to participate in our community. 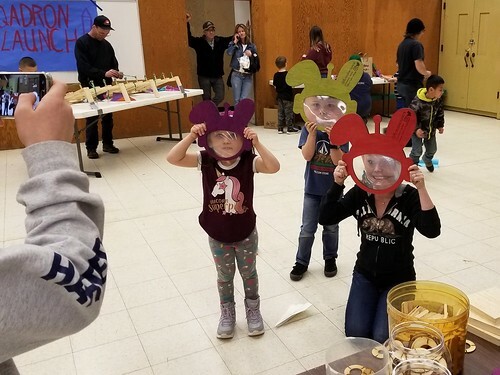 Also on the community front, we participated (for the third time) in the third annual Georgetown School Family Tinker Night, an event coordinated by our sister lab at Georgetown School. We brought out a 3D bioprinter and a plotter, and the ever popular Nova (our space bunny mascot) fresnel lens family face distorters. 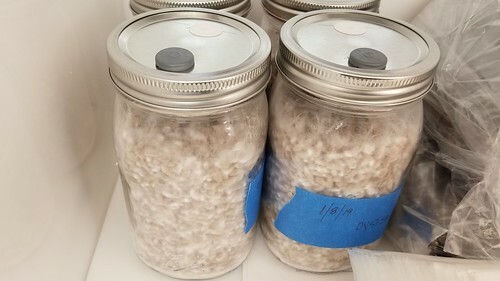 The jars we inoculated with mushroom spawn earlier in the month are thriving, and we’ll be scaling that project up soon. 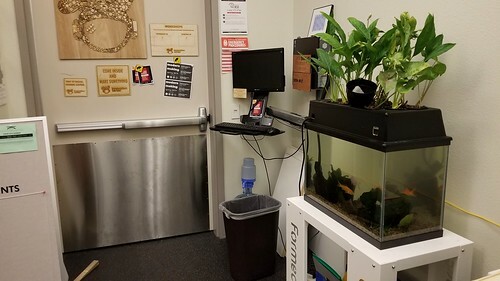 The Science Fish have returned from the library, as we plan and implement whatever v2.0 of our aquaponics efforts will look like. Yes, those are the same three fish – Phoebe, Phinley, and Phreud – still with us after more than two years, and yes, the water cleared up quickly and it’s crystal clear now. 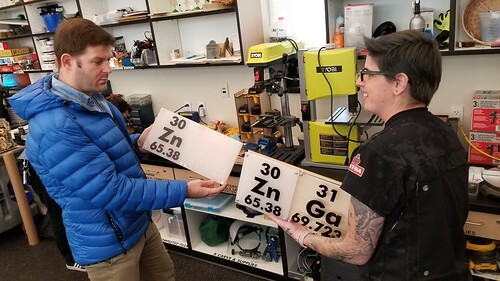 As part of the CCC Maker grant, we’re able to pay interns to do makerspace-related projects, and some of them are working on a large-scale, interactive periodic table of the elements, to be installed in our large lecture hall. Here Max Mahoney (Chemistry) and Nicole (makerspace facilitator extraordinaire) review some prototypes. We’re looking forward to starting the semester with a Grand Opening next week, and to continuing to advance various efforts, including FermSci and biotinkering, some salon-type events in the planning stages, and a million other things I’m probably forgetting. Onward and upward.